One girl. One dress. One year. For freedom. When sixteen-year-old Bethany Winz learned about the millions of men, women, and children around the world trapped in slavery, her stomach churned. How can anyone do that to another human being? she wondered. And why aren't we doing something? This is the story of Bethany's "something." Journey with her as she wears the same black dress every day for a year to focus attention on the lack of choices people in modern-day slavery face and raise money to help end human trafficking. As Bethany works to bring freedom to people worldwide, she'll discover how much she too needs freedom. You'll be inspired not only to change the world in your own way but also to experience the life-changing freedom of God's irrepressible love. One Dress. 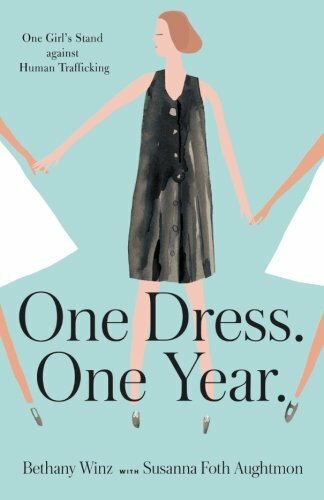 One Year is in essence a compilation of blog posts with additional commentary regarding Bethany Winz's journey over a one-year period. Winz wears the same dress day by day to call attention to the abject misery of people who are still enslaved. She desires to bring awareness to the tragedy of human trafficking and to advocate for it’s elimination. The dress project was inspired by Alex and Brett Harris’ book Do Hard Things: A Teenage Rebellion Against Low Expectations. The Harris’ book explains their project called The Rebelution, which is a teenage rebellion against low expectations. Winz was also inspired by Elaini Ous who wore the same dress for 100 days in order to raise funds to help orphans in India. Ous’ project was wildly successful. You can learn all about her project on her blog MISS-ELAINI-OUS (how cool is that?!). Not an easy task. A task that can only be accomplished through faith in the grace and sacrifice of the Lord and Savior Jesus Christ. Winz desired to serve God and to end human trafficking. She went about it like a teenager; gung-ho and without having completely thought it through. Teenagers do that. Winz started with the desire to help eliminate human trafficking and she wanted to be well known for it. She wanted people to esteem her. She wanted the success seen by the Harris’ and Elaini Ous. Success did not come as she desired. Success came in the way that God desired. Winz learned the hard lesson that not everyone will understand and that many people are unkind. God reminded her of where her worth lies. Winz didn’t raise large sums of money for the charitable organizations that she chose yet she learned of God’s sustaining power in difficult circumstances. This teenage girl went farther than most and she gained wisdom and a deeper understanding of how great is the God who works in and through believers. God did bless her project though. Winz’s leap of faith and her gained wisdom of God’s will and ways has led to an increasing awareness of human trafficking. It has reminded me of the plight of those almost forgotten souls. I wouldn’t be writing this review if it weren’t for her project. She has given me an opportunity to share in her hearts desire to end human trafficking. Winz’s success is due to her realization that grand gestures are not needed and that egos need to be checked at the door. Winz grew closer to God throughout her journey and learned how to more deeply place her whole trust and faith in Christ. To step up for the "widows and orphans*” deeply scarred through slavery. One Dress. One Year is a very simple read. On the negative side there are a fair number of errors that should have been corrected during the proofreading phase. A missing word here and there or a word used incorrectly. These errors generate some unique sentences. I’m not holding that against the book. I’m thankful for the obedience to God that Winz, Alex and Brett Harris, Elaini Ous, and others have displayed and for their example to teenagers today. I am impressed by Winz’s willingness to open her heart up to the rest of us serving as an inspiration. She has inspired me. If you have a teenager in need of inspiration for a life better than the “norm” I would highly recommend that they read Alex and Brett Harris’ book Do Hard Things as well as Bethany Winz’s One Dress. One Year. I pray that our next generation will fight back at the low expectations that society has for them and that they will seek God's will; going forth to serve Him faithfully. **I cannot speak to the leadership and efficacy of these organizations. Bethany Winz is studying social justice at Trevecca Nazarene University where she's learning to love Nashville and urban farming. She already loves Jesus, hot tea, good books, and bacon. She processes the world by writing and blogs about the adventure of growing up and what she's learning about justice at www.bethanywinz.com. She grew up in Orlando, Florida, with her parents and her brother. Susanna Foth Aughtmon is the author of All I Need Is Jesus and a Good Pair of Jeans, My Bangs Look Good and Other Lies I Tell Myself, and I Blame Eve. She coauthored A Trip around the Sun with Richard Foth and New York Times bestselling author Mark Batterson. A pastor's wife and mother of three, Susanna blogs about life's adventures at www.tiredsupergirl.com.